The time to get an Empire DF28GBL Decorative Tempered Glass Fireplace Front is when you decide that you want the perfect look to complement your perfect heating appliance. Which appliance is that exactly? Well, check out the list of compatible appliances on this item page. If you do have one of those appliances, you can use this decorative front to help provide the perfect accent. 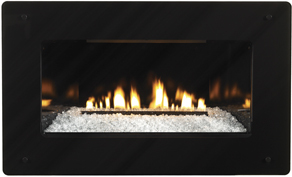 The front is constructed of strong tempered glass and features a striking black border, making it a safe, beautiful, and completely complementary addition to the fireplace. Get your appliance the accessories it needs, starting with this high-quality tempered glass front. I have a VFL28IN72N-1 Fireplace Insert from Empire. The tempered glass suddenly shattered after only 5 years of use. It is out of warranty, and I want to get it fixed . Can I order just the glass panel that slides into this Front? You can order the glass with the outer frame as a replacement part. What is the height and width of this item? This surround measures 37" wide and 23.5" tall.